This is targeted at gazebo7. In order to preserve ABI, the protobuf msg definition has not been changed. As the result the scene (on the rendering side) does not get the link-light parent-child relationship. As a workaround, the lights on the rendering side are moved using the ~/pose/info and ~/pose/local/info topics. An example has been added to the attach_lights.world. 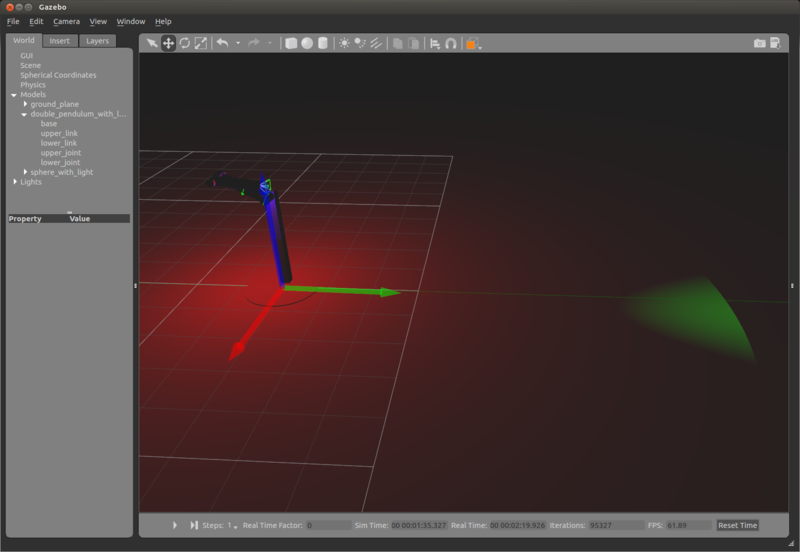 The sphere model (not the double pendulum) has a light attached using the new SDF spec. Shall we deprecate AtatchLightPlugin since this will become the official way of attaching lights to links? I added a deprecation warning. 1eda51d. I noticed that the AttachLightPlugin was also added in gazebo7 so we're deprecating a feature that was introduced in the same major version. Once deprecated, does that mean we are going to remove it in default / gazebo9? I feel like there is a precedent for this but I'm not entirely sure what it was. If I recall correctly, what we did was to deprecate it on all currently released versions (in this case 7 and 8) plus the next release (9). But my head could just be making this up now. looks like the xenial-gpu machine is not installing the latest sdformat 4.4 .0 debs that have the new sdf spec. Do we need to update it manually? sdformat-sdf is not a versioned package and it's shared across all the sdf versions. It should be backwards compatible. It looks like the rendering distance is limited. Out of curiosity, where is that distance specified? you're referring to the green spot light? If so, you can change the range value under attenuation to increase the cut-off distance. In physics/Link, add LoadLight function, and update FillMsg to add light to msg. Little detail: if I pause the world and change the pose of the light, it stays in that position until I press play and it snaps back to the link. This behaviour is inconsistent with other "immovable" entities, such as links - i.e. it is not allowed to manipulate a single link on the GUI. ya light are currently stored in World so they are treated the same as lights without parents. This eventually won't be a problem when lights are loaded in Link class. I have changes to prevent them from being modified but those changes would need to be removed when merging forward so I'm tempted to leave this as is. What do you think? I'm ok with leaving it as it is and addressing the issue in the future.